Im selling my EBR due to me needing money and the fact that I have barely used this gun since I got it. It has recently been upgrade by Sam over at KOA and got the full work over: Gearbox Polish/service, EDGi barrel, R-Hop, Gate Warfet, Prommy Gear set, Prommy Cylinder, Blueprint Motor, Prommy Cylinder head, Prommy Piston, Prommy Piston Head, Prommy Anti Reversal Latch, In total the upgrades for this gun came to around £800, as for how it shoots as you can guess very well it runs well on .32g BBs and sounds amazing. 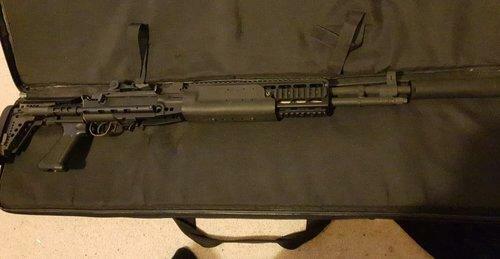 The total cost in all for this gun is £350 for the standard TM m14 then £500 for the now rare G&P EBR kit and the a further £800 on the upgrades so its a £1650 gun which has been used only 3 times but am looking for around £750 for it and am open to reasonable offers.